Please let us choose what beaming/warping effects our characters use. I know that people have said its a game limitation, but anything can be overcome and I for one would be more then willing to pay for this feature as an unlock on a character. I have dumped hundreds of hours into my main Federation character, have easily over $1000 USD put into her. And as much as I want to lvl up a new AoD character, they will never be as good as my main. So I would simply like to use the Discovery effects such as beaming, warping, scanning, and anything else I missed. Even just beaming and warping would be fine and I would have no problem shelling out even up to $20 USD for that simple feature. Let us players that have been here a while also be able to be part of the group. Without having to go through ungodly grind again. Please? Edit: And I know this is at least partially possible due to the April fools event that allows us to turn on the joke sounds of the devs and peeps making all the sounds of our ships and effects. Which is to say, they'll only do it if they expect people would pay for it. 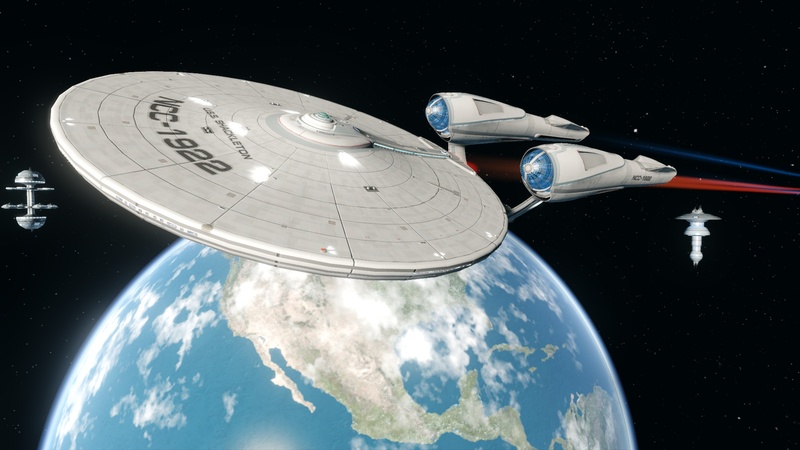 Personally I'd have thought it best tied to the ship... so a ship from TOS would have TOS beaming, DSC wiuld have DSC beaming and so on... then it might make more sense when using alien transporters (rom or kdf) to have their effect rather than fed, or vice versa. The way it is now is as if every toon has a transporter in their tricorder (which also never changes), rather than in the ship. Having a "transporter" gear slot would be ideal, but having it tied to ship would be a decent second choice. However, making them tied to the ship wouldn't allow Cryptic to monetize them, whereas with an item they could sell them. I'm kinda surprised that the Discovery lockbox ships don't use the same warp animations as the Discovery captains. I mean we have the Kelvin ships, that override the warp animations with those from Into Darkness. But I guess technical issues have come up. Easiest thing I could think of would be to allow for changing the character's starting field. Basically it seems the warp in, beam in, etc. effects are linked to Fed, Klingon, Romulan, AoY, DSC, etc. rather than per character. So it is difficult to re-engineer that to make those effects linked per character instead. But it shouldn't be an issue at all to simply change from Fed to DSC or to AoY. The effects would be all or nothing in this fashion however. This should be an easy thing to do. Just unhook the dedicated animations and make it variable with all the animations in a specific list that the user can choose from. Kinda like how they let you change the UI colors. Hard coding them is lazy, not difficult. > This should be an easy thing to do. Just unhook the dedicated animations and make it variable with all the animations in a specific list that the user can choose from. Kinda like how they let you change the UI colors. > Hard coding them is lazy, not difficult. I suspect it's embedded so deeply into the code (from when they assumed it would never change) that it would be difficult to decouple at the best of times. Since then, we've had so many changes of ownership and staff that there's probably nobody left with any clue how to change it. And that's IF they still have the source code for the module. And rewriting from scratch doesn't bring in the money. Yeah, given that it's attached to character type, you'd think that it's a basic 'flag' variable. Modern Fed/TOS Fed/AOD Fed/Rom/KDF/etc. And then you'd just have a drop-down menu on your character sheet, like for Title, to set the flag for that character. But, apparently, that's not how it is. Hmm. More likely they intentionally didn't make those ships override the warp animation, because they knew they were going to make a disco origin and the warp animation would go there. The AoY ships don't override with the TOS warp effect, either. You only get that with TOS toons. I'd for sure pay for this option. > I'm kinda surprised that the Discovery lockbox ships don't use the same warp animations as the Discovery captains. I mean we have the Kelvin ships, that override the warp animations with those from Into Darkness. > But I guess technical issues have come up. My guess is that while the Disco ships (Walker Scaler and Malachowski) are directly from that era (either ported forward in time or found in Shipyard 39), the T6 Walker and Crossfield are essentially replica ships, using current tech shoved into older hull designs. At least, that's my headcanon on it.